Well, with the passing of the not-so-mini’s birthday, the holidays here are in full swing. Since its just the three of us for Thanksgiving, its a lot less prep than most people, especially since Cowboy is working that day, and I work graveyard the night before. Crafting and cleaning are happening, since there is not as much time as I would like to complete the crafts. 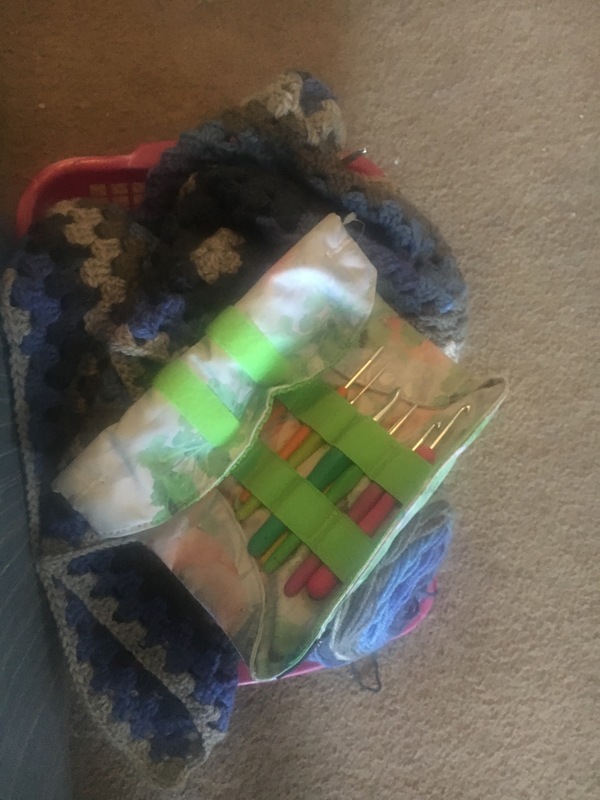 I have a few quilting projects to do, some crochet, and a few other crafting projects I want to get done, plus lots of baking. Since I am in an office now with a small staff, I would love to bring in some kind of fresh baked cookie every week for everyone to share. Plus I want to make a few quilted ornaments for our tree since we are still trying to reestablish out collection after they were all lost in our move here. This time of year, though, not having friends comes in handy, since I don’t have friends to get or make gifts for. Gotta look on the bright side of everything, right? Cowboy and I were talking about the Not-So-Mini’s Christmas present the other day. His main gift is going to be a laptop since he is using my old one and the charging port isn’t working right. And Cowboy’s main Christmas gift will actually be Christmas and birthday together. Recently, one of Cowboy’s coworkers put in his 2 weeks notice. When trying to decide how to replace this person, he suggested Cowboy for the job. When he got the call with the offer, we were surprised, this came totally out of left field. Well, since it is, technically, a promotion, he accepted after we briefly discussed if he was up to the task or not. We decided that, yes, he can do it and is up for the task. Great! Now, because the position he would be leaving is essential to the operation of the casino, he can’t really begin his new job until he is replaced on shift and the new person is ready to go solo. After searching for about a week for a new person, I got a phone call. Apparently, they pulled an old application I had with the casino, asked everyone higher up, and Cowboy. They all agreed I can do it and there would be no conflict since we would not be on shift together and there would be no way one could supervise the other. So, the job is mine pending my casino card (7 year criminal history, 9 panel drug test, and finger prints). As soon as the background check comes through I will give my notice at Goodwill and will be moving on. Goodwill has been good to us. It has kept rent paid, kept the lights on and kept food on the table. I have made some great friends here and learned a lot of good things. The people there are all great and I have enjoyed my time with every one of them. This is a great opportunity for my family and myself. Getting a jump on things for the year. This is my “in progress” basket by my spot on the couch where I sit. When it is done, this will be a full size afghan that will be a gift for Cowboy. I’m using a Caron Cake in Berries and Cream. Of course, I will post a picture of the finished product. Six months ago, we went to the feed store to look at adding another parakeet to our cage. We just went just to look with no intention of actually buying, just checking the general health of the current flock, the colors available and the activity. We were mainly looking for a female since our current female, Bird Snow, is an albino and, therefore, does not mate. For a while, Cowboy has been wanting a different kind of bird, a small parrot. When we went into the area where they keep the birds, guess what was there? That’s right, small parrots, more specifically, lovebirds! So we went ahead and got a lovebird! Go in for a $20 parakeet, without even being positive we were going to buy one, and walk out with a $50 lovebird, plus food for her, since she doesn’t eat the same food as the parakeets. Since we have gotten them, we have been working with the parakeets to hand tame them. Well, Ramsey has started to stand on my finger and eat seed out of my open palm! I can also, slowly, move my hand with him on my finger, without him freaking out! So proud of him! I know it has been a VERY long time since I last wrote. Lots of time has passed and so much has happened. Well, I will be writing more often. I have so many ideas and plans for this blog that I hope to accomplish by this time next year! About a year and a half ago, I got Cowboy some parakeets for Father’s Day. He has had birds for most of his teenage years up through adulthood so they are always a good gift for him. We have a blue/gray/black male named Ramsey Birdton and an albino we think is female names Bird Snow. They each have their own personalities They love being put to bed at night, Cowboy always talks to them and says goodnight before he covers them, they squawk and talk when they are ready for me to uncover them, I say good morning and refresh their food and water while talking to them. Bird Snow is more skittish and does not like being handled and she hates being out of the cage. Ramsey is more inquisitive and he will eat millet out of Cowboy’s hand. Ramsey loves taking a bath and he actually occasionally can be found in their water dish taking a bath and swimming if their bath tub isn’t in the cage. We have tried to give them fresh produce but, they have never eaten it. These two do not even like the honey treat we had in the cage for them when we first got them. They prefer their toys be made of wood and rope. We recently introduced a nesting box to their cage but, after 3 weeks, they have not laid any eggs yet. I did some research into possible reasons why they did not attempt to breed and it turns out that albinos are not good breeders. So we are looking into getting another female to see if she might breed with Ramsey. I will keep an update on things as we progress and the birds grow. I don’t really speak about this much, but I feel pain differently from others. I have a chromosome deformity that manifests itself in a form of CIPA, Congenital Indifference to Pain with Analgesia (to see a worst case, watch the House episode called “Indifference”). For me, it manifests in not being able to feel specific types of pain and, when I do feel pain, in someone without CIPA, it would probably be enough for them to require heavy narcotic pain relief. To me, that is a cramp. I also can not regulate my body temperature. My coworkers have nick named me The Painless Wonder. But, it is a curse, despite what some might think. When we are in bed and my husband wants to hold me in his arms, I can’t have any blankets on and I need a fan on me at all times. I tend to take too-hot showers (so my water heater has a safety to I don’t burn myself). This inability to feel pain is why my teeth have rotted out. I don’t feel a tooth ache that would signify a cavity and, even with brushing and flossing, I don’t know about a cavity until the tooth has crumbled. Still think its awesome? When I was pregnant with my son, I was in full blown labor at 25 weeks and did not know! Thankfully, I had a doctor’s appointment and the doctor realized I was contracting in time to save him. In the climate I live in, I constantly have a frozen bottle of water with me and I can tell you where the air flow for the air conditioner points in most public establishments. In the winter, I rely on the actual weather app on my phone (not the WTForcast app, that is just for fun, lol) to tell me how cold it will be so I know what kind of jacket I will need because I really can’t tell myself. I wait until others in my home are dressed before getting dressed myself to decide how many layers I need. I have overheated at work a few times. My coworkers know what to look for to see if I need to step under the air conditioner’s vent for a moment or grab a frozen water, thankfully. I have to keep a close eye on my blood pressure for reasons other than my heart because, if I am in serious “pain” and not feeling it, my blood pressure will skyrocket as a way of warning me. I have broken my foot more times than I can count without knowing it, my knee cap floats, my toes have all been broken. All because I can’t feel the pain and continue to push past when a normal person would know to stop. I have woken up after a 4 day stretch at work unable to move my back because I, again, pushed past when a normal person would have taken it easy because I didn’t feel when I strained my back. If I drink, I don’t realize when I am drunk because I do not feel drunk. This is why I am very careful when I drink and only drink weak drinks or limit myself to one beer. I usually do not speak publicly about this issue. It is very rare and not really something I want out there. But, a few comments from people lately have caused me to speak out. They have called me lucky and said they wish they had what I have. No, you really don’t. Trust me on this.